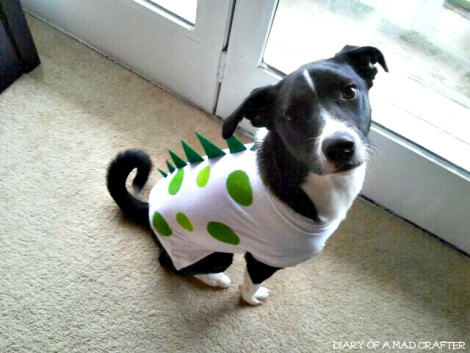 Make a dinosaur T-shirt for your dog! Modify a T-shirt to fit your dog or cut a T-shirt into the shape of a dog coat. Cut pieces of foam into circles, stick the foam to a tile or wood block, dip the foam in paint and use the foam to stamp spots onto the T-shirt. Cut pieces of felt into triangles, cut slits along the back of the shirt and sew the base of the triangles into the slits.